If you ask someone what kind of animal they consider to be the sweetest on our planet, many will answer without hesitation: "Panda!" And we definitely agree with them. Let's find as many pandas as possible in this picture. How many bamboo bears can you spot? And what do you know about pandas? Here are 12 interesting facts about these incredibly cute animals. 1. Armand David, the French scientist-missionary, was the person who introduced a big panda to the European community. After traveling to China, in 1875, he brought a black and white fur of an unusual creature in the Paris Museum. 2. After examining a panda for the first time, scientists thought that it is a huge raccoon! And only after several decades, it was established that in fact, this animal is a bear. 3. Panda is listed in the Guinness Book of Records as the cutest animal in the world. 4. In 1961, the founder of the World Wildlife Fund, Peter Scott, chose this animal as a symbol of his organization. 5. 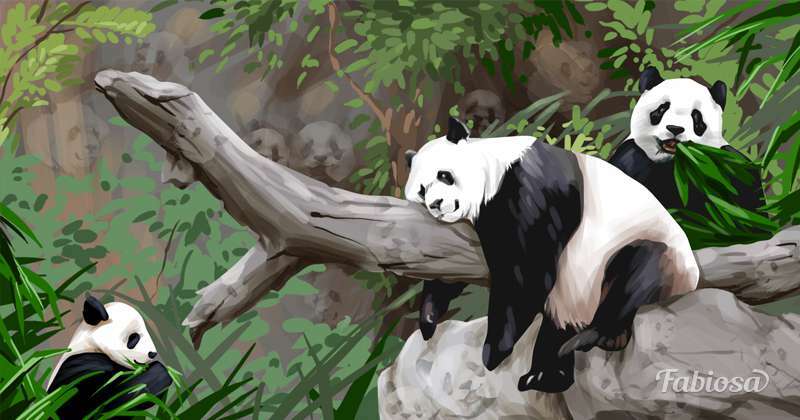 One of the slang names for Chinese special services is "panda". 6. Almost 12 hours a day, these funny animals ... eat! 7. Pandas have six fingers, which allows them to grab the bamboo branches. 8. Unlike their fellow bears, these animals do not hibernate. 9. Breeding pandas in captivity is a real achievement. According to researchers, bamboo bears "do not particularly seek to reproduce." Apparently, that is why there are only about 200 species remained in zoos and nurseries. 10. Panda cubs are born white. And only after a few weeks, they get their black and white color. 11. The red panda belongs to a separate family - the mustelidae (the marten). 12. The Internet browser "Firefox" got its name in honor of one of the names of the small panda (ailurus fulgens). Have you managed to find every single one? Write in the comments! READ ALSO: Cutest Panda On Earth Celebrates His Third Birthday, And National Zoo Prepared A Special Gift For Him: "We Celebrated In Style"